Spinal muscular atrophy (SMA) is a genetic neuromuscular disease characterized by progressive muscle weakness and atrophy. We report a case of a 36-year-old man with SMA type 3 who presented to our emergency department with epigastric pain and vomiting. He was found to have severe ketoacidosis on laboratory evaluation. The patient’s symptoms and ketoacidosis resolved after dextrose infusion and a relatively small amount of sodium bicarbonate infusion. Given the severity of the ketosis that seemed inconsistent with moderate starvation alone, we postulate that there must have been other contributing factors besides moderate starvation that might explain the severity of acidosis in this particular patient. These factors include low muscle mass, disturbed fatty acid metabolism, hormonal imbalances and defective glucose metabolism. 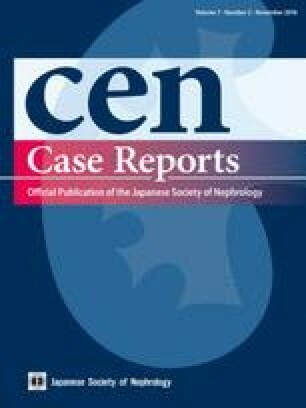 Ketoacidosis is an under-recognized entity in patients with neuromuscular diseases and requires a high index of suspicion for prompt diagnosis and management. Bassel Lakkis, Alissar El Chediak contributed equally to the manuscript. An informed consent was obtained from the patient reported.